This is the color printer series we use in our office at PrinterTechs! 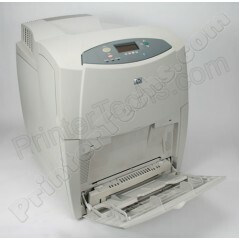 The HP Color LaserJet 4650n is a large color printer, good for workgroup use. The 4650n includes a duplexer for double-sided printing, a JetDirect card for connecting the printer to a network, a 500-sheet cassette paper tray, plus a manual feed tray. This is an excellent printer for medium to high volume color printing. It is a standard workhorse in offices all over the world. Compared to HP's latest line of color LaserJets, a refurbished 4650n can save you a bundle in printing costs! Check out toner cost comparisons below -- you'll be surprised at the savings! Disable toner check feature in the diagnostics menu.This is really sweet. Disabling the toner check means the printer doesn't check to see if toner cartridges are installed. This allows you to test each cartridge individually to see if one is defective. Disable toner check when cartridges are "empty" -- Ok, so this is the same feature as above but it has multiple uses. The toner level indicators in printers are not always accurate. In most color printers, if the printer thinks your are out of toner it's game over, the printer stops until you buy another toner cartridge. But just because the printer says you are out of toner doesn't mean you really are. Disabling the toner check allows you to keep going, and this saves you money because you get more use out of a toner that really isn't empty! Toner cartridges are large, 8000 page yield at 5% coverage. Smaller color laserjets only print 2,000-4,000 pages per cartridge. Small toners have a higher cost per page. LaserJet 4650 remanufactured toners are readily available and reasonably priced. Toner cartridges for new printers tend to be ridiculously expensive. See below for a cost analysis. When shopping for printers people usually forget to look at the cost of consumables (toner, transfer kit, fuser, etc). The total cost of ownership is often ignored with printers. New printers are manufactured as vehicles to sell you more toner or ink. In many cases a set of new toner cartridges costs more than the new printer. But remember -- the cartridges that come with many new printers are only partially filled. The manufacturer wants you buying toner right away. 18.9" x 20" x 22.3"